bottom dweller – Hello Korea ! I saw a t.v. commercial for marble beds. Platform beds, with sheets of inlaid marble instead of a mattress. The jim jil bang had a marble floor that we slept on. It was NOT good for a night’s sleep, so like many things about this place, I am totally bewildered. So I’ve always hated my bed, since it takes up half my apartment and it’s too big. Lately, ever since Willie and Lenn came over and he had to sleep on my yoga mat and exclaimed how it was more comfortable than his bed, I’ve taken to doing the same. Plus, it’s right by the window and under the air conditioner if it’s too humid for fresh air. 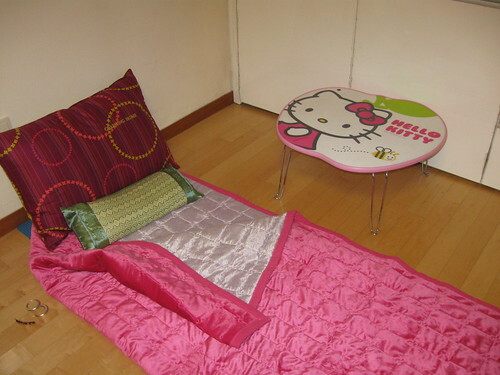 Note the Hello Kitty folding table! Now, I never was into all this cutsie stuff while in the states, and people here have pointed out that those are children’s items here, but it’s sooooo damned sophisticated and stuffy here – people dress like they’re going on a date to a cultural event just to go to work, etc., so I’m rebelling by suddenly having great affection for all things child-like. Anyway, this was the last one at E-mart, and it had no price tag on it. So I had to suffer while they did a price check, and it was only 10,000 won! That’s over half what the plain faux wood ugly ones cost, and it’s only about $8.00. Can you imagine what this Sanrio table would cost in the States? Oh, and this was not the first time I scored big at E-mart on an unpriced item. Now, I kind of look for odd items on purpose, as they seem to be last season’s things that didn’t move or something, but because they are the only items, they don’t warrent getting a sale display.